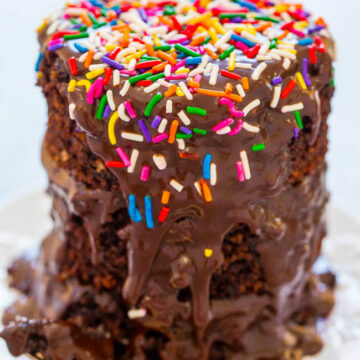 Chocolate Hot Fudge Mini Layer Cake – Rich, decadent, over-the-top fudgy cake that uses hot fudge instead of frosting!! You don’t need special pans for this EASY, no-mixer, mini cake that’s perfect for special events!! 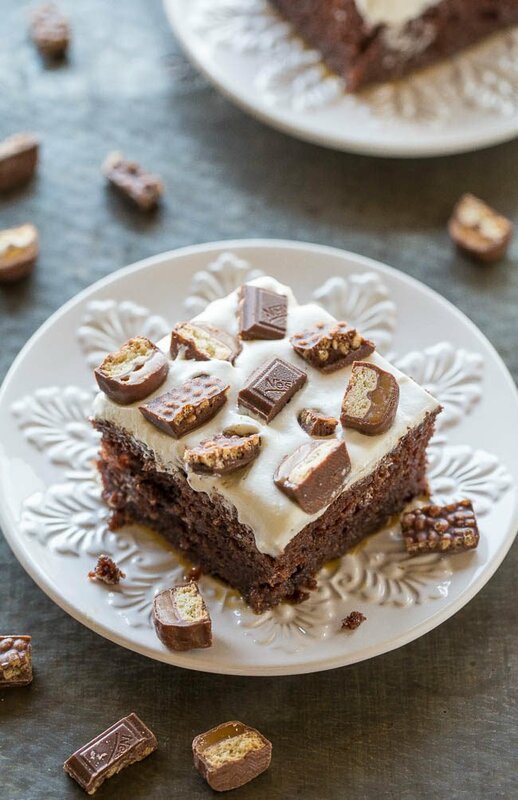 This cake is literally a hot fudgy mess and you’re going to love every decadent bite. It’s an easy, no-mixer cake that uses the same cake base as this 2012 Chocolate Cake with Chocolate Ganache. It’s a reader favorite and has been made and loved by thousands. After baking the recipe as a 9-inch square cake, I made a triple layer mini cake by cutting out smaller rounds from the 9-inch cake. I don’t have mini cake pans and I doubt many of you do either so this is the perfect solution and cheater’s way of making a babycake. 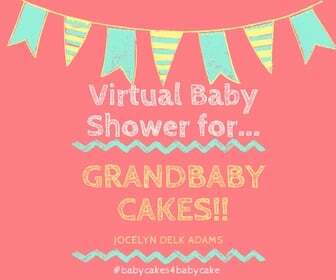 The cake is actually a virtual baby shower cake for Jocelyn of Grandbaby Cakes. A group of other food bloggers and I thought it would fun to surprise her with this fun day that we’re calling #babycake4babycakes. I was with Jocelyn earlier this year with some other food bloggers during what was literally the wee hours of her pregnancy. We were rubbing her belly and hoping and praying for her that she was actually expecting – something that she’s been dreaming of for a long time. Our belly rubs apparently worked because she’s set to give birth very soon and I’m so happy for her. 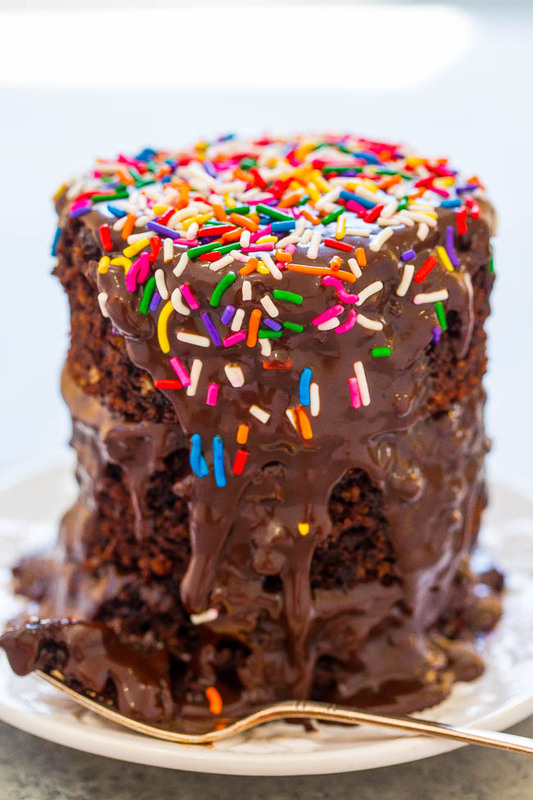 I wish I could bring her this mini chocolate cake right now because it’s rich, decadent, over-the-top fudgy, and the sprinkles add a wonderful contrast to the uber moist cake. It’s the type of cake you crave if you’re pregnant (or PMSing) if I’m being honest. I went with hot fudge rather than a traditional buttercream frosting because it keeps thing extremely easy (just open a jar of your favorite or make my 10-Minute Homemade Hot Fudge) and dollop it on. It’s going to run down the sides. This is not a neat and tidy cake like the cakes Jocelyn makes in her amazing cookbook. But it’s the best messy cake ever. I was only able to get 3 layers stacked without the cake toppling over or the layers sliding off. Try adding a fourth layer if you dare or make two 2-layer cakes. It’s a great birthday cake for someone special, a Valentine’s Day cake, or dessert for a girls-night-in. Check out the other bloggers who are participating in this fun event! To a large mixing bowl add the egg, sugar, yogurt, oil, and whisk until smooth and combined. Add the coffee, cocoa powder, and whisk vigorously until batter is smooth and free from lumps. Alternatively use a handheld electric mixer to quickly break up cocoa lumps. Note about coffee – The coffee does not make the cake taste like a coffee-flavored cake. Rather, it brings out and enhances the flavor of the cocoa powder and adds depth of flavor; I highly recommend coffee but use water if you must. The coffee can be any temperature other than piping hot; you don’t want to scramble the egg. Add the flour, baking soda, baking powder, salt, and whisk until just combined, about 1 minute; don’t overmix. Turn batter out into prepared pan, smoothing the top lightly with a spatula if necessary, and bake for about 25 to 29 minutes, or until top has set and a toothpick or cake tester inserted in the center comes out clean. I’ve found that climate and brands of ingredients used impact the baking time for this cake greatly, and have baked it in as short as 25 minutes and as long as 32; bake until it’s done in your oven. Set cake aside to cool completely in pan on top of a wire rack. 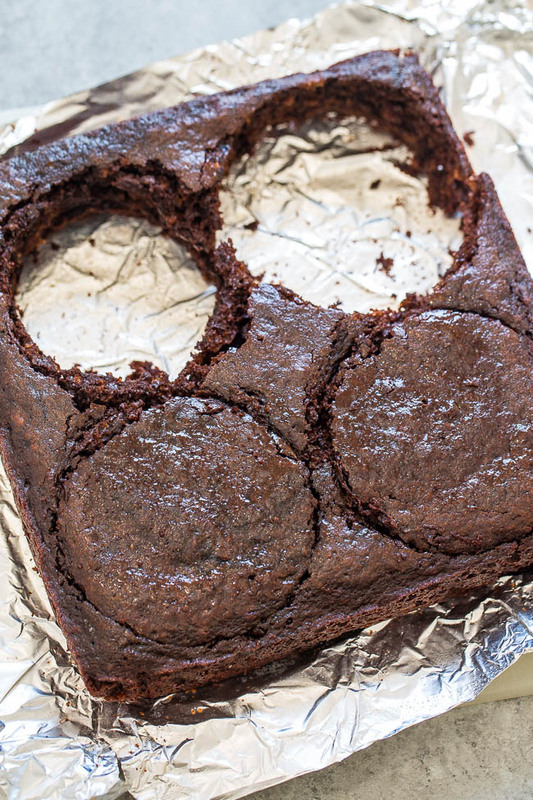 After cake has cooled, using the aluminum foil overhang, lift cake out onto cutting board and using a 3 to 4-inch diameter cookie-cutter that’s been sprayed with cooking spray (helps cake release much cleaner from the cutter), cut 4 circles out; set aside. Enjoy nibbling on the scraps. Hot Fudge – Make your own hot fudge using my 10-Minute Homemade Hot Fudge or use a thick store bought hot fudge. Do not use ice cream ‘sundae sauce’ (i.e. Hershey’s Syrup or similar) because it’s too thin and runny and won’t hold up well. Tip -I recommend assembling the cake layers very shortly before serving because they may have a tendency to slide around if you assemble too far in advance. 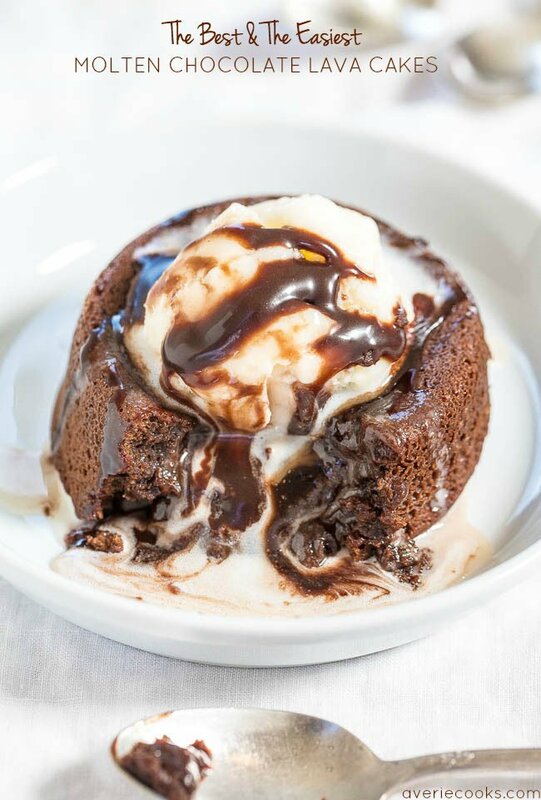 Place one cake round on a serving platter and top with about 3 tablespoons hot fudge and spread it evenly. Repeat with the cake/hot fudge layering process until finished. When you place a cake layer on top of the hot fudge, it will naturally run down the sides of the cake. 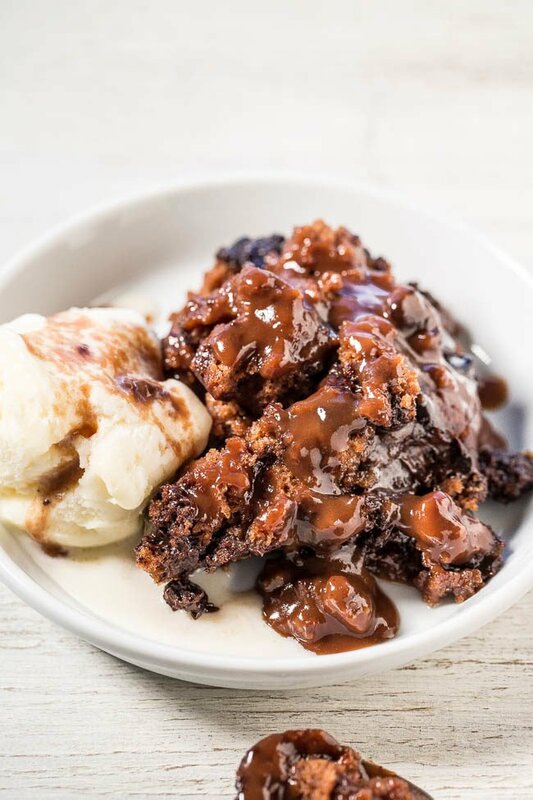 The more hot fudge you add, the greater the run-down factor; this is not a neat and tidy cake. 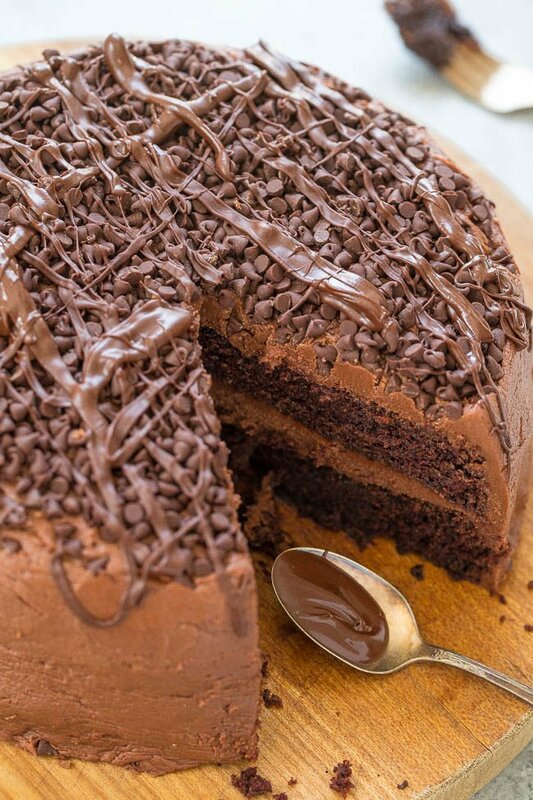 Optionally add sprinkles to the top of the cake before serving. Cake is best fresh but will keep airtight for up to 5 days at room temp. 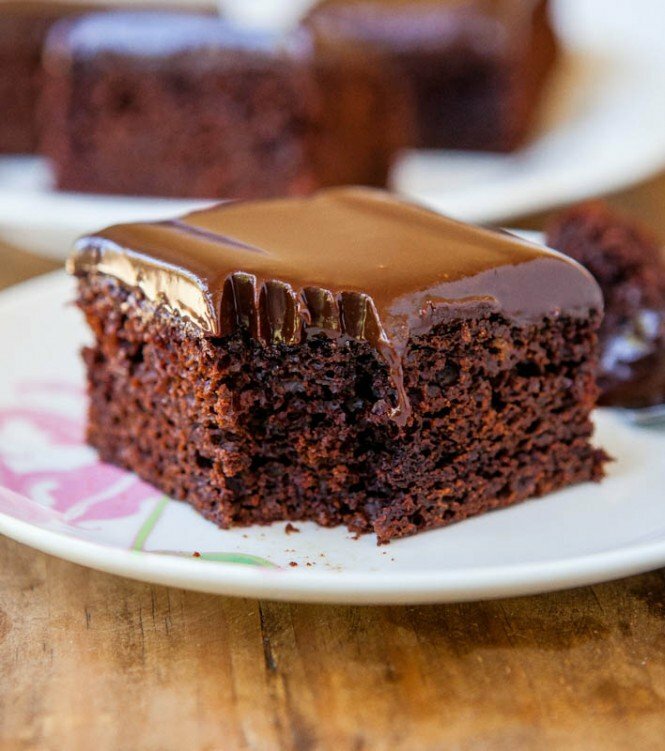 The Best Chocolate Cake With Chocolate Ganache – The best chocolate cake I’ve ever had, and the easiest to make! Nothing fussy or complicated and delivers amazing results every time! 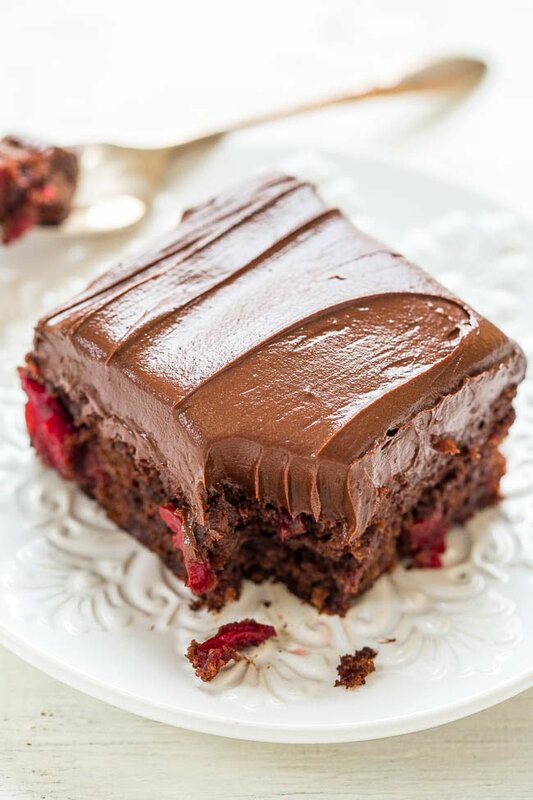 Triple Chocolate Cherry Cake – An extremely moist, rich cake that’s so easy and studded with cherries! 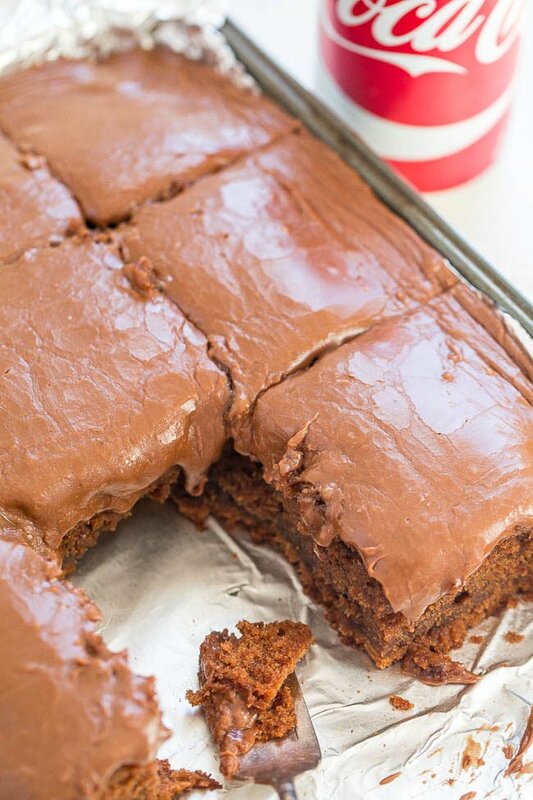 The frosting is silky smooth and my new favorite chocolate frosting! A 10 out of 10 showstopper! 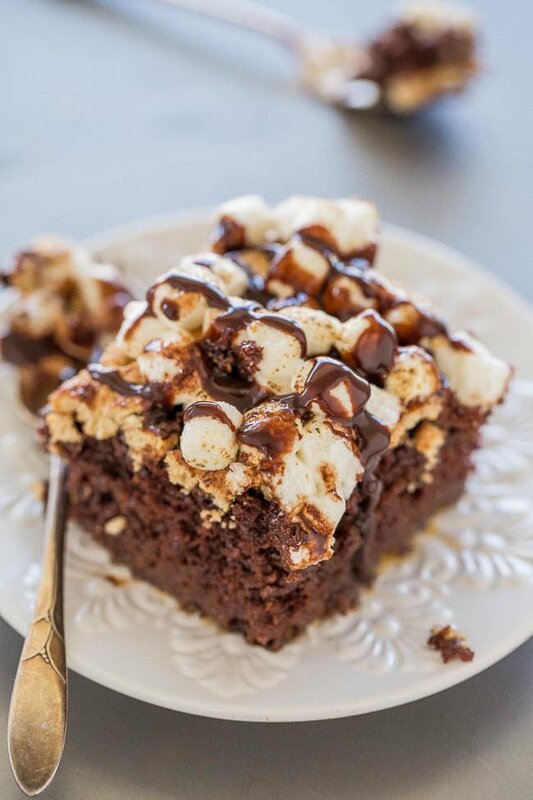 Smores Poke Cake – A supremely moist and decadent chocolate cake topped with graham crackers, marshmallows, and hot fudge! Campfire not required for this fun and easy twist on smores! Better-Than-Anything Chocolate Cake – Worthy of its name and one of the BEST cakes you will EVER eat! 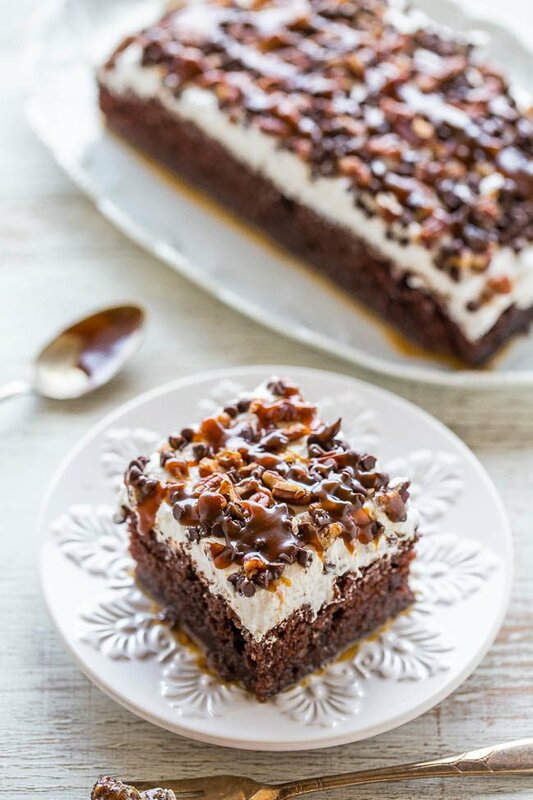 Doesn’t get any better than chocolate, caramel, whipped topping, and candy in an easy, no-mixer cake! 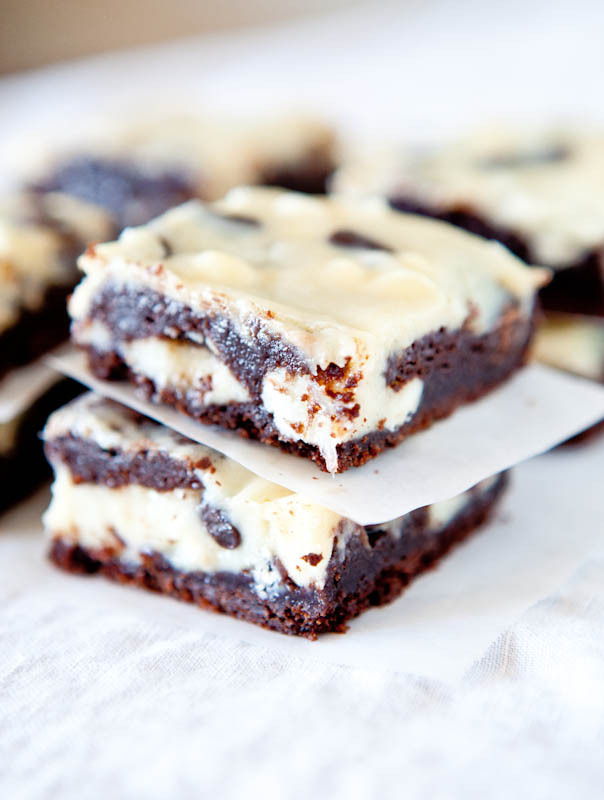 White and Dark Chocolate Cream Cheese Chocolate Cake Bars – Chocolate cake with chocolate chips, white chocolate chips and filled with cream cheese! Fast, easy, and foolproof! OMG so gooey and yummy!!! 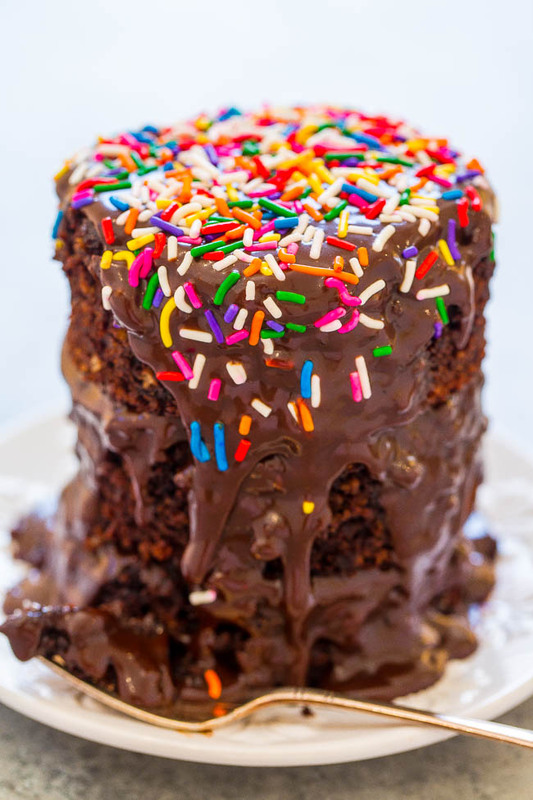 I love the hot fudge idea for frosting and this is an adorable mini layer cake! I would probably take some assistance from a wooden skewer to get a 4th layer to stay on top……I know mine would topple otherwise! I had every intention of making four layers. That was the subject line. Until I actually tried it, sans skewer, and decided that a 3 layer cake was just fine :) We ate the other layer on its own with more hot fudge of course! I love love love this!! 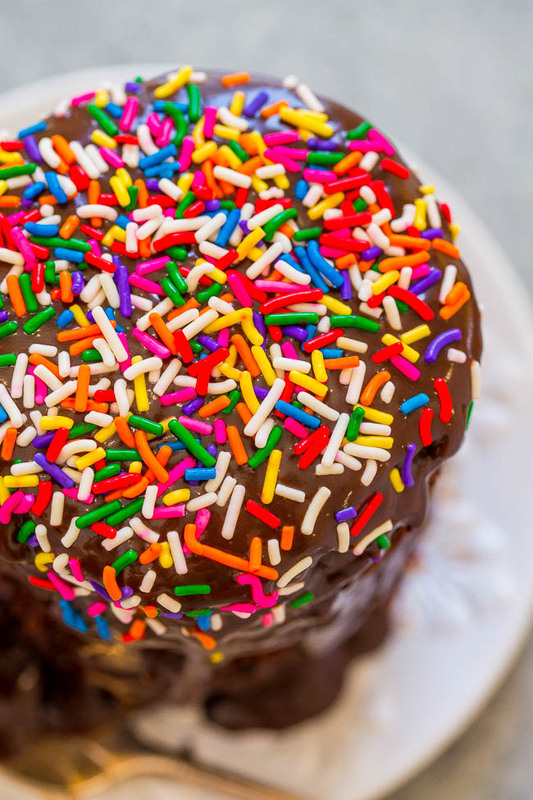 Those sprinkles, that frosting OMG! Okay yeah, so these got pinned right away! I love these cakes! They are so baby shower perfect. You have been an absolute treasure to work with. I love your honesty. You are so real and I appreciate that in people. I hope this isn’t the last time our paths cross. Nice working with you Averie! Thanks for all the kind words! I can’t wait to cross paths again! Averie, girl those belly rubs certainly worked! It is so crazy how early that was. I was literally 2 weeks pregnant and didn’t know for sure haha! I was so so happy to be with you and the other ladies during that time. The support and love is something I will always remember. Thank you for being part of this! Congrats and have a wonderful motherhood journey. This looks amazing. I actually have 2 mini cake pans. I bought them when my kids were young for tea party cakes. This is what dreams are made of!! Gimme all the sprinkles!! !